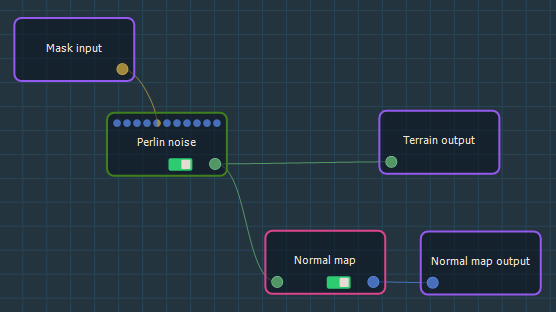 You can create new component inputs and outputs, including terrain, mask, value, color map, and vector map. Right-click in an open component graph (see Viewing a component graph) and select Edit > Create node > Components > Inputs or Outputs and choose one of the six options available. In the example below, we add a mask input, and a normal map output. Each input and output corresponds to a connector on the component. 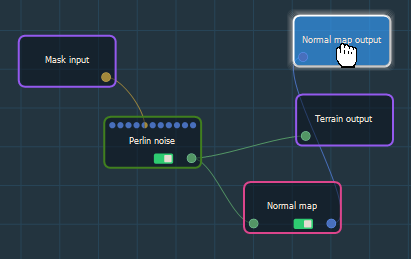 In the example below, we have a brown mask input connector, a green terrain output connector, and a blue normal map output connector. To change the order of the input or output connectors, move the component input and component output nodes vertically.